(Benokraitis, Marriage and Families, Pg. 78). Although racism is sadly nothing new, this ongoing issue in American society in regards to racial minorities continues to detrimentally shape the lives of families in several ways. 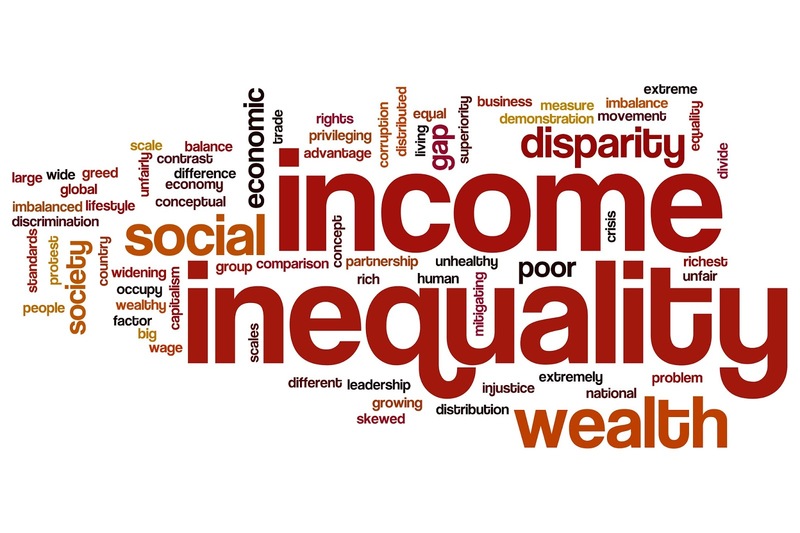 For example, financial and educational status, and how the criminal justice system operates, affects families of color, resulting in higher rates of poverty, health problems, and stress. The ethnic groups most affected in America by racism are African Americans, American Indians, Asian Americans, Latino's and Middle Eastern Americans. Racial profiling, or the use of race or ethnicity as grounds for suspecting someone of having committed an offense, is by far one of the largest judgmental issues in society that must cease. Racial profiling often affects hiring and promotion, interracial marriage and relationships, and how one is treated in society. More extreme forms of discrimination such as Jim Crow laws, or any of the laws that enforced racial segregation in the South between the end of Reconstruction in 1877 and the beginning of the civil rights movement in the 1950s, all lend to inequality and grave injustice to people of color, a term signifying any person who is not white. It does not solely refer to African-Americans; rather, it encompasses all non-white groups and emphasizes the common experiences of systemic racism. To determine various groups in society that intersect racially and determine the balance of power, one must look at minority and dominant groups. A minority group is a group of people that are treated differently by the dominant group due to physical or cultural characteristics, gender, sexual orientation, religion, and/or skin color. A dominant group is any physically or culturally distinctive group that has the most economic and political power, the greatest privileges, and the highest social status. This group is predominantly white, or Caucasian. Minorities outnumber white people, yet generally have less power, privilege, and social status. Most white people, in contrast, are privileged only due to their skin color. This is referred to as white privilege. In order to relate to how the balances of power intersect, one must consider a continuum, or a continuous sequence in which adjacent elements are not perceptibly different from each other, although the extremes are quite distinct. One part of the continuum is assimilation, or conformity of ethnic group members to the culture of the dominant group, including intermarriage. The other end of the continuum is pluralism, maintaining many aspects of one’s original culture, including language and marrying within one’s own ethnic group, while living peacefully with the dominant culture. There are also groups of people in the middle of the continuum, those that blend into society through acculturation, or the process of adopting the language, values, beliefs, roles, and other characteristics of the dominant culture. Racism is a set of beliefs that dominate a racial group in society making the dominant group superior to other groups of people. Numerous people, both Caucasian and African American, view race relations differently. For example, in general, African Americans view racism as an ongoing issue without resolution while many Caucasians view racism as a problem that never existed or has been solved. In turn, some Caucasians believe that anti-white bias is a bigger social problem than anti-black bias. Examples of these movements can be seen with #WhiteLivesMatter and #AllLivesMatter. What these movements create is a pro-white agenda that continues to fuel prejudice and discrimination, in an attempt to silence the causes of movements like #BlackLivesMatter. Prejudice is a negative way of thinking that automatically prejudges people simply because they are different. This may be due to race, ethnicity, religion, and sexual gender. While all human beings can be prejudiced, minorities are vastly targeted. Discrimination is more harmful because instead of a way of thinking, discrimination is a learned behavior where people are treated unfairly only due to their difference from the dominant group. Discrimination is responsible for lack of or loss of employment, non acceptance to a club, university, religious group or social class. Discrimination is responsible for hate crimes and death. A history of inequality and racism in a society affects families of color in several ways via individual and institutional discrimination. Individual discrimination is harmful behavior to another on a one to one basis from a member of a dominant group in society to a minority group. While institutional or systemic discrimination is being treated differently as a result of society’s laws, rules, policies, and practices. Whether past or present, racial inequality is similar. Jim Crow laws do not exist however, white privilege still does. The forms of racism are different only in how they are presented in society today. For example, there are no longer white and black water fountains; however, an African American man walking down the same side of the street may cause a discriminatory white person to cross the street. Even though laws and rights have changed, behaviors and actions of people have not changed. 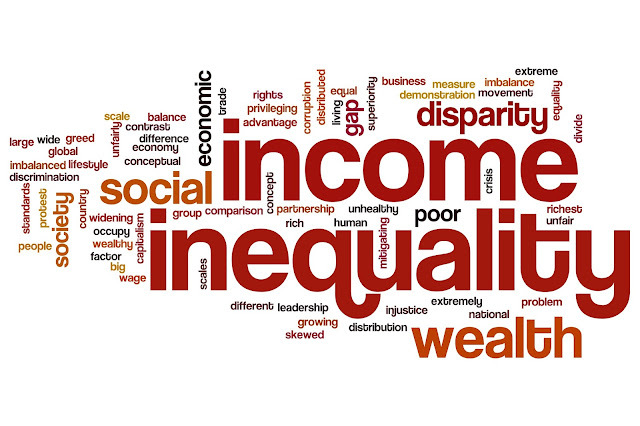 All of these experiences shape families because society as a whole affects employment, financial status, education, and the right to exist alongside everyone else, peacefully, without inequality. Children that are raised in either environments, a discriminatory household, or a household where being taught to bow down or bend to the dominant culture is practiced, are equally harmful. A household that teaches equality, understanding, compassion and peace is ideal. Unfortunately, once the child is subject to the American educational system and American society, there is a chance they succumb to what society mirrors, extreme left or right behavior. The middle way or a way of existing without discrimination and racism towards one another seems like a utopian dream; however, with education, understanding, awareness, advocacy and solidarity, it is indeed possible. Linked here and below, is a LIVE Interview with Jane Elliott and myself over a landline before the days of Skype. Jane is an internationally known teacher, lecturer, diversity trainer, and recipient of the National Mental Health Association Award for Excellence in Education. She exposes prejudice and bigotry for what it is, an irrational class system based upon purely arbitrary factors. Jane is a brilliant, brave woman and the audio and documentary will blow your mind when you see how easy it is to teach judgment, discrimination, and racism. If you think this does not apply to you, you are in for a rude awakening. During this conversation, Jane and I speak frankly away from what the documentary below depicts. Both are necessary for all people to watch and listen to in order to understand how EASY it is to teach discrimination. In response to the assassination of Dr. Martin Luther King, Jr., Jane Elliott devised the Blue Eyes/Brown Eyes exercise. This now famous exercise labels participants as inferior or superior based solely upon the color of their eyes and exposes them to the experience of being a minority. 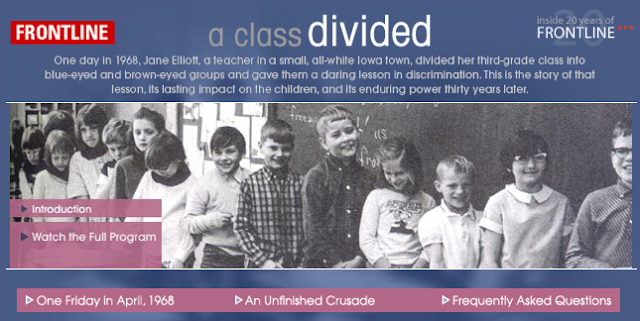 Everyone who is exposed to Jane Elliott's work, be it through a lecture, workshop, or video, is dramatically affected by it. Jane taught this in a 98% white Anglo-Saxon town, Riceville, Iowa, 1968. The effects are monumental. Jane and her family paid dearly for initially teaching this exercise. After 1968, this exercise has been taught professionally to all adults regardless of race, ethnicity, sexual gender, orientation and religion. Nijole Benokraitis. (2011). Marriage and Families. Seventh edition. Pg. 78.